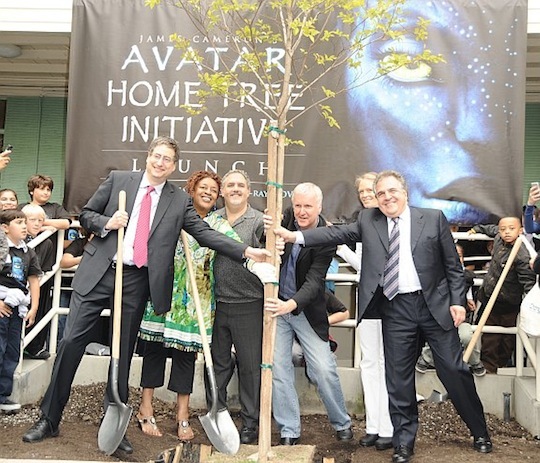 (Washington, DC – Jan. 19) Earth Day Network announced today that it has exceeded its one-million-tree goal for The Avatar Home Tree Initiative with the planting of 1,006,639 trees on six continents in 2010. The resulting reforestation, sustainable development and increase in environmental awareness will last far into the future. The project was made possible through the generous support of Twentieth Century Fox Home Entertainment and its Avatar Blu-ray DVD. It was accomplished through the tireless work of 17 partner organizations. Over 31,000 individuals were directly involved in the massive planting effort. In creating this project, we wanted to make every tree count. That's why we selected ecosystems around the globe where we believed trees were most crucial to protect, and partners we were confident would work the hardest to get strong healthy trees in the ground and nurture them to maturity. While our requirements were high, in the end, the results of this project surpassed our expectations, said Kathleen Rogers, Earth Day Network President. Planting trees fights global climate change and is the essence of service inspired by Earth Day. We want to thank our partner Twentieth Century Fox Home Entertainment for making this meaningful project possible. At the core of Avatar lies an inspiring message of empowerment and self-discovery, said Mike Dunn, President Worldwide, Twentieth Century Fox Home Entertainment. Our program to plant one million trees resulted in fans around the world fervently getting involved to promote a healthy, sustainable planet. That alone has made this initiative a huge success." Earth Day Network reports that the trees planted for the Initiative protect some of the world's most bio-diverse and threatened forests; restore acres destroyed by fire, flood and wind; enable local and regional governments to rebuild communities devastated by disaster; engage tens of thousands of children and youth in learning about the environment; create career opportunities in the green economy; and provide hands-on service opportunities to volunteers of all ages. In one of the most compelling projects, in Haiti, Trees for the Future worked with local citizens under the Avatar Home Tree Initiative to address urgent needs to reforest degraded hillsides, produce fruit and biodiesel fuel and establish intensive hillside farming practices. Over 500,000 trees have been planted in Haiti. Each of the million trees planted under the Avatar Home Tree Initiative has been added to Earth Day Network's Billion Acts of Green® campaign, a global service project to log one billion sustainable actions in advance of the Rio+20 Earth Summit in 2012. Additionally, the trees planted in this initiative have been pledged towards the Billion Trees Campaign, a worldwide tree planting initiative of the United Nations Environment Programme. The tree planting was also a part of Twentieth Century Fox Home Entertainment's parent company News Corporation's Global Energy Initiative, a company‐wide commitment to reduce impacts on climate and engage global audiences with environmental issues. Landcare Australia, Ltd. worked with national parks and land care groups to help restore vulnerable areas of metropolitan New South Wales and Victoria, focusing on areas with unique and threatened animal species. Vereniging voor Bos in Vlaanderen, or Organization for Forests in Flanders, helped combat the environmental effects of intensive livestock and agricultural production by working with private landowners in Flanders to reforest their properties. To combat agricultural expansion and urban sprawl, SOS MATA Atlântica Foundation worked with local communities to plant native trees as a means to restore the Atlantic Forest, one of the most biologically diverse and severely threatened forest ecosystems in the world. Tree Canada joined the Avatar Home Tree Initiative to restore 800 hectares (1,976 acres) of pine forest of southeastern Manitoba on land that was devastated by hurricane-force winds in 2005. With its bi-cultural mission, Kinomé's Trees & Life program will help nine and 10 year old children in southern France plant their own trees. For every tree the children plant in France, children of the same age in Senegal will plant two trees, thus advancing both global reforestation and intercultural awareness. The Berlin Energy Agency's environmental youth organization, ClubE, planted trees in southern Berlin as part of its mission to raise awareness among young people about sustainable development and lifestyles and to promote job opportunities for young people in the green economy. Trees for the Future, a U.S.-based organization that works with Haitian farmers to bring degraded lands back to productivity through the planting of beneficial trees, worked with communities to plant fruit and other native trees using sustainable agroforestry practices. Their work will help combat centuries of environmental degradation and natural disasters, including the catastrophic January 2010 earthquake. The community and Municipality of San Giovanni in Persiceto have recently taken on the Cassa Budrie reforestation project. They restored and preserved a local wetland and forest located on a major flood plain, helping to promote local water security and prevent soil erosion. Other objectives of the project are biodiversity recovery and the creation of a local carbon sink to combat global climate change. To create a sustainable future, a tailored tree-planting project in a Japanese school gave students and teachers the opportunity to plant trees on their campus and engage in related environmental education and school greening activities. Sierra Gorda Ecological Group (SGEG) has been working since 1987 to protect the Sierra Gorda Biosphere Reserve, the most ecologically diverse protected area of Mexico. The SGEG will work with local communities and farmers to reforest both agricultural land and pristine forests. Local communities will also directly benefit as local watersheds are restored. Stichting wAarde, or the Earth Value Foundation, worked with local youth to plant trees in areas around Amsterdam and Utrecht. The trees planted will not only engage youth and communities in learning about their local environment, but will also improve air quality, create healthier outdoor spaces and restore urban habitats for wildlife. Plantemos Para el Planeta, or Trees for the Planet, ambitiously aims to reforest Spain by planting one tree for every Spaniard. The group worked to reforest the southeastern Costa del Sol, which was ravaged by wildfire in 2009, and to create recreation spaces for individuals to appreciate the beauty of nature. Under Sweden's Forest in School program, children and their teachers traveled on excursions to plant spruce, pine, birch and beech trees in northeast Sweden with professional guidance and intensive environmental and reforestation education. The UK is one of the least wooded countries in Europe with only four percent native woodland cover. Leading woodland conservation charity, The Woodland Trust is encouraging community groups across the UK to transform their local areas by planting native trees for the benefit of local people, wildlife and the environment as part of the Trust's 'More Trees, More Good' campaign. Communities were able to apply for free tree packs and receive support via Woodland Trust's advice centre. MillionTreesNYC plants trees throughout New York City's five boroughs, focusing on low- to-middle-income neighborhoods to increase green spaces in the community and improve urban environmental health for area residents. MillionTreesNYC participated in the Initiative through their fall Reforestation Day's city-wide tree plantings. Since 1981, Friends of the Urban Forest has helped San Franciscans to plant and care for street trees and sidewalk gardens, thereby supporting the health and livability of the urban environment. The organization is currently focused on plantings in low-income neighborhoods, resulting in increased community interaction and cooperation. TreePeople is a Los Angeles based non-profit whose mission is to improve the urban environment of the city by planting trees. TreePeople's Fruit Tree Program helped provide low-income families, school children and community residents with a source of free fruit to help alleviate hunger, address childhood diabetes and obesity, improve nutrition, and provide shade, beauty and cleaner air now and for decades to come. Through the planting of over one million trees in these target countries, the Avatar Home Tree Initiative helped create a more sustainable planet for all living things across Europe, Africa, the Americas and Asia. Individuals learned more about their role in nature, low income families have access to a better quality of life, communities have taken action on behalf of the planet and the local and global environment has been restored for generations to come. Earth Day Network was founded on the premise that all people, regardless of race, gender, income, or geography, have a moral right to a healthy, sustainable environment. Our mission is to broaden and diversify the environmental movement worldwide, and to mobilize it as the most effective vehicle for promoting a healthy, sustainable environment. We pursue our mission through a combination of education, public policy, and consumer activism campaigns. Earth Day Network's campaigns and programs are predicated on the belief that an educated, energized population will take action to secure a healthy future for itself and its children. The organization has a global reach with a network of more than 22,000 partners and organizations in 192 countries. Earth Day Network is a 501(c)3 organization located in Washington, D.C.
Earth Day, April 22, 2010 -(L) Tom Rothmann, Chairman and CEO Fox Film Entertainment, Actress CCH Pounder (Neytiri's Mother), Jon Landau- Producer, James Cameron, Writer/Director, Suzy Cameron, Jim Gianopulos, Chairman and CEO Fox Film Entertainment celebrated the Avatar Million Trees Initiative by planting the first tree in North America on the 20th Century Fox lot.